Another ✅ is on my bucket list this Fall. I finally found someone to take me on a private hunt for truffles. My close friend, who happened to be in Paris for a few days, flew over to Budapest when she heard that I was going into this uncharted hunt in Hungary. We had the most unexpected amazing experience one morning as we trekked up to the woods in Hungary. Professional truffle hunter Imre Lencses guided us through the process, along with his two trained truffle-hunting dogs, one-eyed Sailor and Aliz. We pulled deeper and deeper into the dark forest of oak, elm and European walnut trees, driven by the earthy, woodsy aroma of truffles. The dogs unleashed their wild instincts and thorough sniffing all around the bush in excitement. The truffle surfaced from the gritty, dark soil as the dogs started scraping the ground in maniac excitement. They would dig away until Imre arrived with his own digging tool, to eventually unearth a small, black, unimpressive golf-ball-sized nugget of fungus. Imre hurried into his pocket with a small bite of treats, rewarding the dogs for their effort. In two hours, Imre collected over 2 kilograms of truffles, tucked carefully into a small leather pouch he wore by his side. These truffles are called tartufo nero, or Tuber melanosporum, also referred to as Black Diamonds. Lunch was optional, but we couldn’t resist Imre’s offerings of a salad with truffles, a club sandwich with truffles, and more excitingly, a tiramisu dessert with the truffles adding more ‘umami.’ A small packet of shavings of this tartufo nero will bring awesomeness to any meal. We were grateful to enjoy our bountiful findings and back home, savored omelets we made with truffles and pasta with generous shavings. 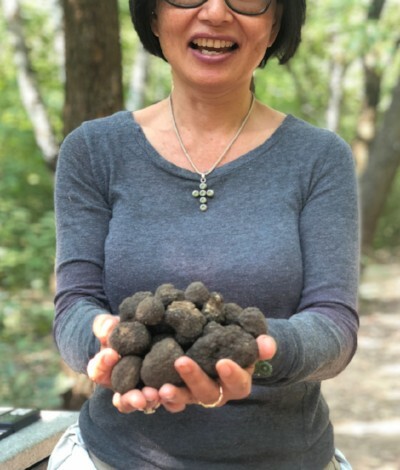 I also learned from a few of our truffle aficionados that North American varieties don’t share the same intense aroma of their European cousins found in Italy, France, Spain or Hungary—but then again, they don’t cost thousands of dollars a pound. One disturbing note I learned from Imre on this expedition is that inexperienced hunters from North America often use rakes to rip up the forest floor while searching. Not only can they damage the product, they also eventually destroy the local fauna. In Europe, every one of the hunters is registered locally and licensed to keep better control. Stay tuned for next year, as we explore a different region of Hungary from June and the beginning of August. We will experience another episode of truffle hunting for the highly prized white truffles. You can find more pictures of our truffle hunt here.